At present, number of android smartphone are available in the market. If you also hate Samsung ( as I do ) and can't afford to buy iPhone then Sony can be better choice for you. This is what I had done. In last winter, I just bought a new Sony Xperia C3 Dual and it's a perfect choice in my budget range. Almost everything is fine but there is little problem in battery life. Although Sony smartphones are very well battery but due to long-time use I just hate the way battery drain so fast. Later on I researched, Experimented and came to know about Stamina mode. It is an inbuilt feature especially provided for Sony Xperia Series and If you're one of the its user, you can take advantage of it to improve battery life. This is what I am going to teach you here. Now without wasting your time, let's Begin this tutorial. 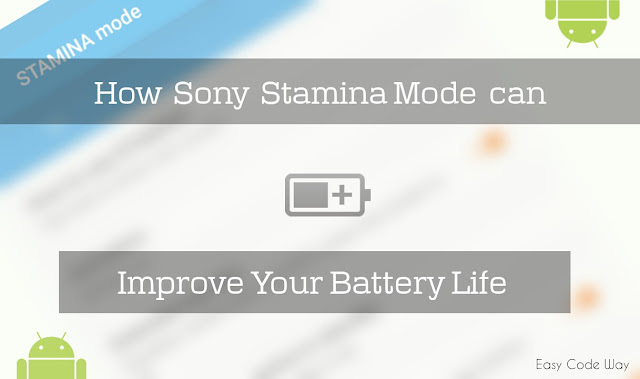 As already mentioned, Stamina mode is an inbuilt feature in Sony smartphones which let you save or improve battery life. Now the question is - How does it work? Let me take an example to explain the working. Whenever your phone screen is off, some of the apps may work in background and we all know that these apps also chew battery. For an example, If mobile data or Wi-Fi is turned ON and screen is locked then too your phone will continuously retrieve data from the Internet and you'll get notifications. This case can be seen in almost all apps like Facebook, Instagram, Whatsapp etc., So did you want to waste battery in such useless things? Definitely NOT. This is where Stamina Mode can be helpful for you. It saves power when the screen is locked by temporarily disabling Wi-Fi, mobile data and other similar settings. Most of the features will be inactive but you'll still receive phone calls, SMS/MMS messages, calendar & alarm notifications. The Music Player and FM will work, and download/upload in progress will be allowed to finish. As soon as you'll turn on the screen, phone will function normally. Moreover the extended usage feature of stamina mode can also restrict performance without affecting appearance much. 1. First Go to settings from your Sony Device. 2. Scroll down and you'll find "Power Management" option. open it. 3. Now find and click on "Stamina Mode". 4. Tap the scroll button from the top to turn it ON ( see below picture for help ). 5. Make sure to turn ON Extended Standby and Extended Usage options also. It's obvious from above that stamina mode will be activated when the screen is off. But what is the minimum battery limit below which it works? So simple. You can set it yourself. After above steps, click on "Activation" button and a small pop-up box will appear showing battery level with a slider below it. Just move the slider and set the minimum threshold as per your choice. I prefer to keep it at 100%. Finally click on "OK" button and Yippee! you've done it. Sometimes we open our phone to check time by using power button. 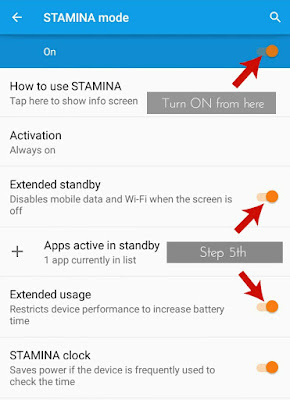 This make all apps to start work again as they were stopped by Stamina mode. Stamina Clock will keep them stopped until you touch the screen as well as deactivate it manually. 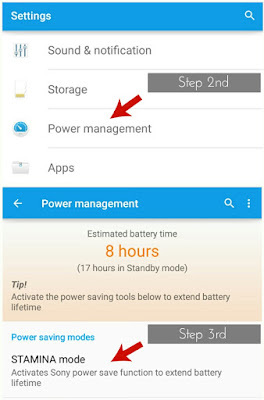 Summing up, we can say that their will be little bit improve in battery by using this feature. Isn't it? Now if you want to enable this, simple move the scroll button next to the option and a popup box will appear to allow permission. Click on "Activate" button and that's it. 1. 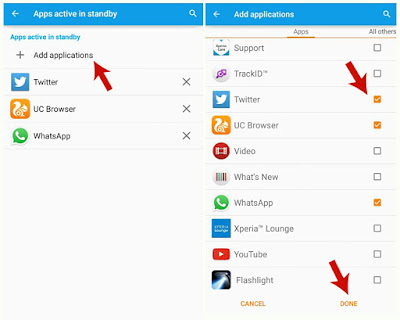 Click on "Apps in Active Standby" option. 2. Now select "Add Applications". 4. Finally Hit "Done" button. After this, apps will be added to the white list and you can undo these changes at any time. I hope you've complete knowledge on Sony stamina mode after reading this tutorial. If you still have some problem or suggestions, please comment below. Did this method work for you to save little battery life? Let me know.